APTA's 2013 Nominating Committee selected current Vice Chair Peter Varga, chief executive officer, Interurban Transit Partnership (The Rapid), as APTA chair for 2013-2014, at a meeting in Dallas on August 14. Phillip A. Washington, general manager manager, Regional Transportation District, Denver, CO, was nominated vice chair, and Doran J. Barnes, executive director, Foothill Transit, West Covina, CA, will continue his three-year term as secretary-treasurer. The committee also selected members-at-large for both the APTA Executive Committee and the APTA Board of Directors. APTA members will select officers and board members via a virtual meeting on Sept. 24 at 3 p.m. Eastern time. APTA will send call-information to each member organization’s designated contact in the next few weeks. For the full list of selected nominees, click here. 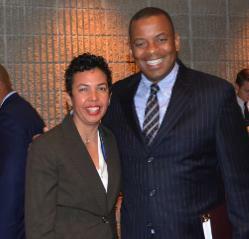 Federal investments in infrastructure are essential to boosting economic development, DOT Secretary Anthony Foxx said at the National Conference of State Legislatures' legislative summit in Atlanta on Aug.12. Flora Castillo, APTA chair and member of New Jersey Transit Corporation's board of directors, attended the summit. FTA published final policy guidance on Aug. 14, which, in conjunction with the final rule FTA published in January 2013, outlines the details of the new, streamlined evaluation and rating process for New and Small Starts projects under MAP-21. FTA has posted updated reporting instructions and forms for the new process, available on its website. Working with FTA, Operation Lifesaver awarded $194,000 to eight public transit agencies for their innovative rail safety projects. To compete for grants, which totaled up to $25,000 each and required matching funds from non-federal partners, proposals had to focus on safety education or public awareness initiatives. 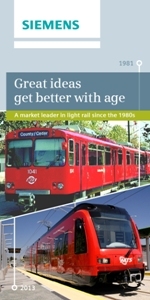 The grantees were TriMet, Portland, OR; the Massachusetts Bay Transportation Authority; Caltrain, San Mateo, CA; SunRail, Central Florida, FLA; Regional Transportation District, Denver, CO; Capital Metro, Austin, TX; Sonoma-Marin Area Rail Transit, in the North Bay of California: and the DC DOT, Washington, DC. According to APTA's August Transit Savings Report, individuals who ride public transportation instead of driving can save, on average, more than $842 this month, and $10,103 annually. Over the course of a year, parking costs alone for a vehicle can amount to an average of $1,995, according to the report. As an added incentive to register for APTA's Annual Meeting in Chicago, Cubic Transportation Systems Inc. is offering free Ventra farecards to all attendees who are registered by Sept. 9. A letter will accompany the farecards explaining how to use them in getting from the Chicago airports to the meeting hotel. Be sure and sign up by Sept. 9 to be eligible for the free cards! The last of the Chicago Transit Authority's oldest rail cars were retired earlier this month. An eight-car 2200 Series train that entered service in 1969 was open to the public for a ceremonial final day on Aug. 9 before being officially closed. As part of an effort to cut crime at the Alewife MBTA subway and bus station in Cambridge, MA, transit police placed a cardboard cutout of a police officer in the bicycle cage. The fake officer, along with video cameras and a new lock, has cut bike thefts by 67 percent, according to transit police. A couple got married aboard a TransLink bus in Vancouver, BC, on the very same No. 3 bus on which they met in April 2012.